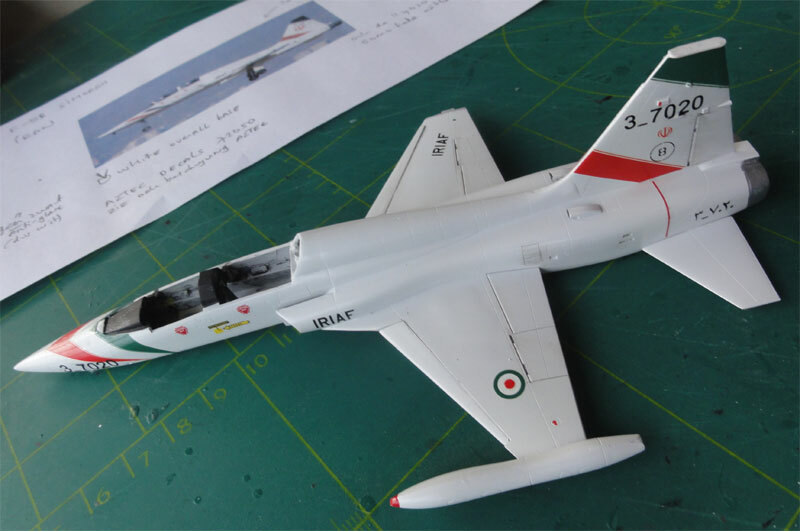 The next F-5B model was for a "Islamic Republic of Iran Air Force" (IRAN) F-5B "Simorgh". 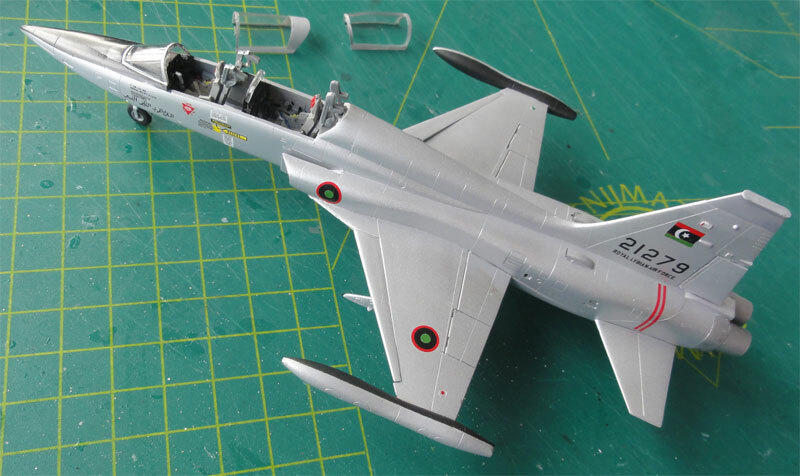 In the past over 120 F-5A /B aircraft were supplied during the Shah regime. Many former US supplied aircraft were refurbished during the arms embargo by the Iran Manufacturing Industries (HESA). 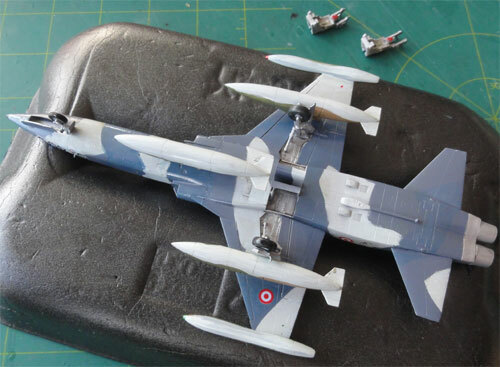 The Simorgh is local conversion of a F-5A to a two seater F-5B. On the internet variations are seen of these aircraft: some have tip tanks with black anti-glare, others don't and there are more smaller differences. So pick a scheme and photo and complete the model as seen. 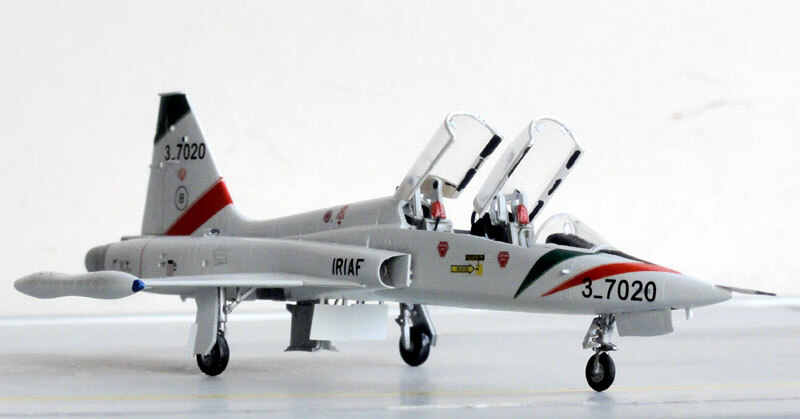 The AZTEC decalset 702050 shows a nice scheme for an IRAN F-5B with coloured stripes in 2005. The model was assembled as per kit as the kit is good as described on page 1... I did not bother further to open up and deepen the jet exhaust pipes. The pipes extend about 0,1 mm at the lower fuselage edges, but it is hardly seen. 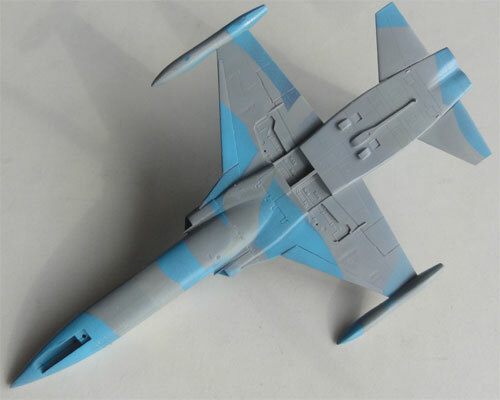 When assembled the model got a base light grey coat with the airbrush to check for any flaws. I needed some putty at the intakes and front fuselage joints. Next, a white coat was airbrushed, I used Revell Aqua Weiss 04. No black anti-glare panels on the coke bottle tanks are seen on my picked F-5B coded "3-7020". The gloss paint was when dry ready to get the AZTEC decals applied on the model. Each decal was "dragged" through a Johnson Future/Pledge varnish bath to prevent "silvering". 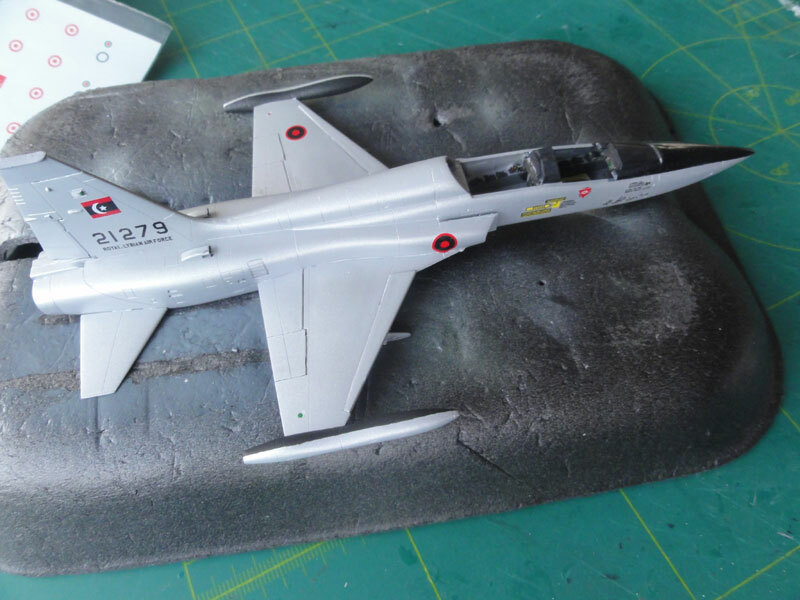 I also added smaller stencils from other F-5 decal sheets such as red circles on the tip tanks. Also the fuel cap markings on the spine were added on the right side. After decalling the model was completed, the edges of the vertical tail were painted to match the decal, so red on some edges. Next was landing gear installment and very similar to the single seat F-5A kit. I added some wiring for the hydraulics on the gear legs. On the wing tip tanks, their tips were painted red and blue. The anti-collision lights are situated on both outher wing areas inside the wing tip. Both on top and below. These lights were suggested with a tiny drop of red and blue paint. Also, the vertical tail edges were painted red and green where there were no decal stripes. The inside edges of the air brakes parts #15, 16 need a bit trimming to fit either open or closed. On this model they were set open. The gear bay interiors were painted aluminium. At each inner bay door #13, 14 an actuator was added from metal rod as well as a few small antennas made from thin card; this varies a bit between individual F-5 Simorghs so check photos. On this model a tiny antenna was set at the spine aft of the rear canopy. 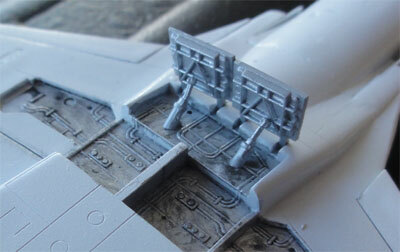 A little "dark wash" was applied in the recessed panels of flaps and inside the gear bays and gear legs. (a mix of diluted black acrylic paint and water). The model got a final varnish Johnson Future/Pledge coat airbrushed on to protect the decals and give an even sheen. The canopies got some mirrors used an etched metal set. The canopies were installed as described on previous NF-5B kits. That completed the model. Military aircraft were used in Persia (now Iran) as early as 1925 with European aircraft used in Imperial Persia. 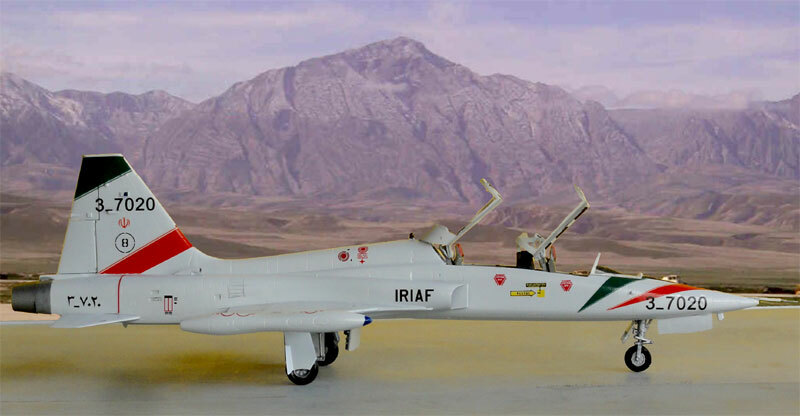 During the Shah regime, that was Western focussed, the "Nirou Havai Shahanshaiye Iran" (Imperial Iranian Air Force) operated many American aircraft. In the 1960s F-86 Sabres, and in February 1965 the first Northrop F-5 aircraft were delivered to the IIAF. Eventually 104 F-5A and 23 F-5B were obtained and the "Golden Crown" aerobatic team also flew the F-5. Other aircraft used in large numbers were the F-4 Phantom and even some F-14 Tomcats in 1970s (their only foreign sale). 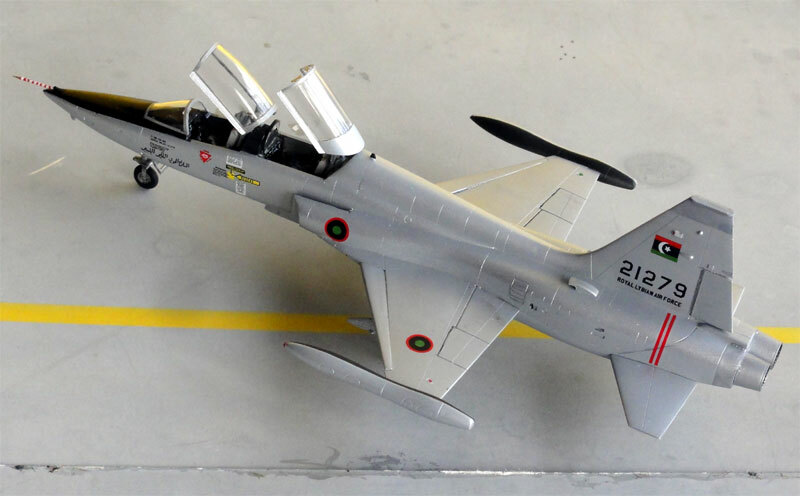 From 1972 over 180 new modern F-5E and F-5F Tigers were delivered and the older F-5 aircraft were sold second hand (e.g. to Turkey, Jordan, South Vietnam, Ethiopia, Greece). The Imperial armed forces were very large and modern forming at that time a stable factor in the rural Middle East. In 1979 a Islamic revolution arised with large political and cultural changes, the Shah went in exile. 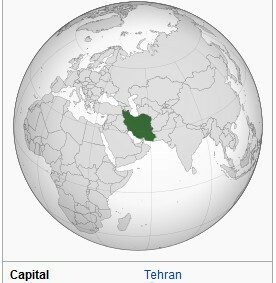 The Islamic Republic of Iran Air Force was established after that regime change. Due to arms embargos it had to improvise in order to operate the existing large aircraft fleet. Local aircraft modernization programs were established with interesting projects like F-14 Tomcats flying with Hawk missiles and a few butterfly tailed F-5 aircraft. 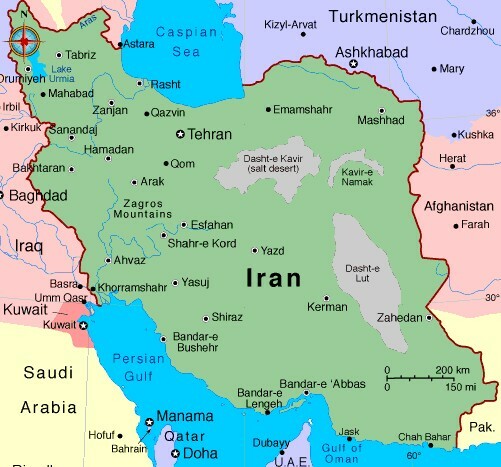 Several local but drastic wars were fought with particularly Iraq from 1980-1988 and 1991 in the "Gulf Wars", also involving other Arab and Western countries. The Iranian F-5's were used a lot. Current air force fleet is probably over 300 combat aircraft including F-5 Tigers, old F-4 Phantoms, some old F-14 Tomcats but also Sukhoi Su-24, MiG-29, Chengu F-7 and former Iraqi Mirage F-1. A large transport and helicopter fleet is also available. 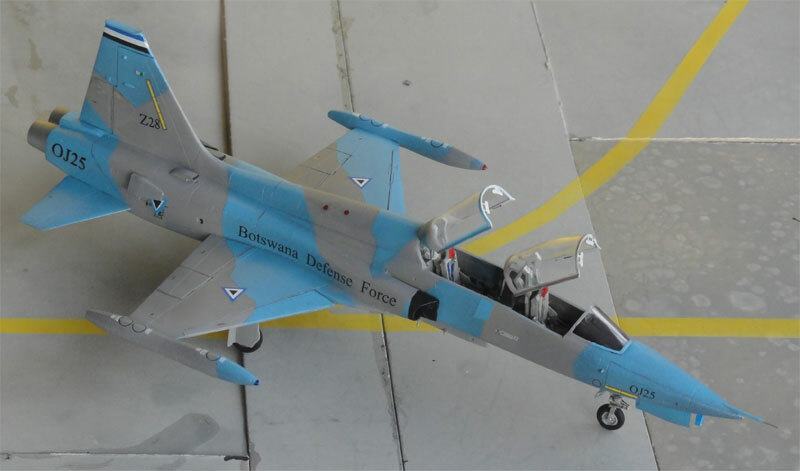 The next ESCI F-5B model made was for a "CF-116" Botswana Defense aircraft. This is an ex-agressor second hand CF-116 aircraft from Canada of which 13 were acquired in 1996 with 2 extra aircraft in 2000. 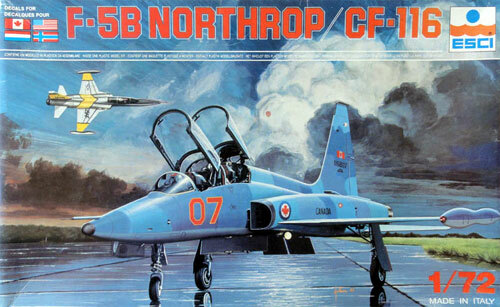 It is called the CF-5A and CF-5D and sports spectacular "blue-ish" colours. AZTEC decal set 72050 provides nice decals. The Botswana national insignia is a blue bordered white triangle with black inserted triangle. The good kit was assembled as described above. Each colour needed masking as the demarcations look rather "sharp". 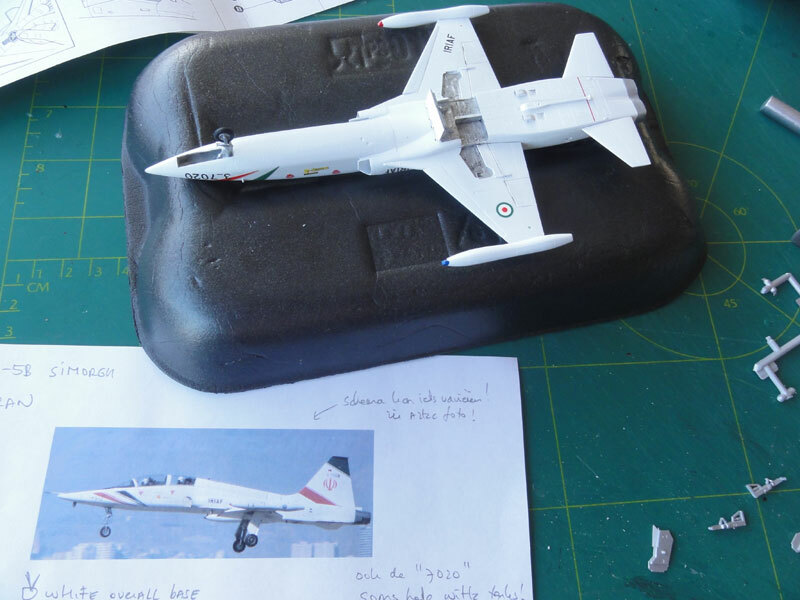 It requires a lot of masking for the "wrap around" scheme with low tack tape and masking film such as from Revell. Note that the fuselage end does not show a metal area, only the exhausts are burned metal. Decals are fine from the AZTEC set. I also added smaller stencils from other F-5 decal sheets such as black outlined circles on the tip tanks. 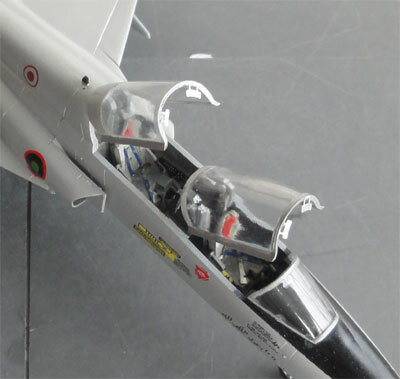 Also the low visibility light strips were applied, these can be found on various F-5 decal sheets. Each decal was "dragged" through a Johnson Pledge varnish bath to prevent "silvering". I later discovered missing fuselage Botswana triangles (I mistakenly applied these on the lower wing). I made the fuselage' ones from bits of the ESCI decals (from the Greece flags...). Note that the chaff dispensers #25C are also seen on the CF-5D which partly cover these triangles. The lower air brakes were mounted closed but a large central pylon was installed at the central fuselage station. Below the nose, a large antenna is seen; this was made from card. The undercarriage was installed and gear bay interiors were painted aluminium. 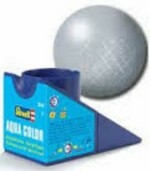 Some "wash" and was applied as described above for the other models. 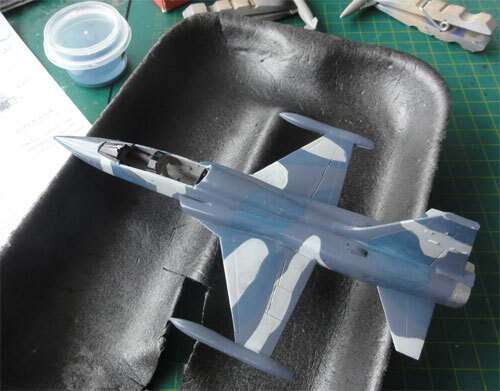 The protecting varnish coat was airbrushed: a coat made a bit duller of a mix of Johnson Pledge/Future and 5% Tamiya X-21 "flat base" matting agent. Botswana (former Bechuana land) became independent in 1966. 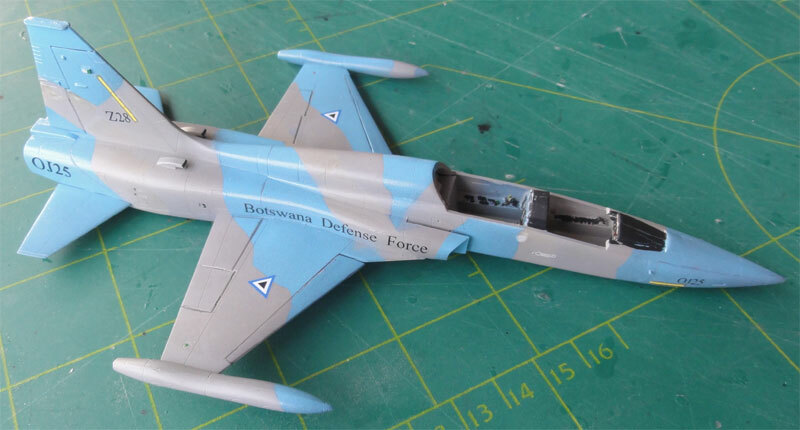 The Botswana Air wing was established as part of the Defence Force (BDF) in 1977. From 1988 B.A.C Strikemasters were operated. 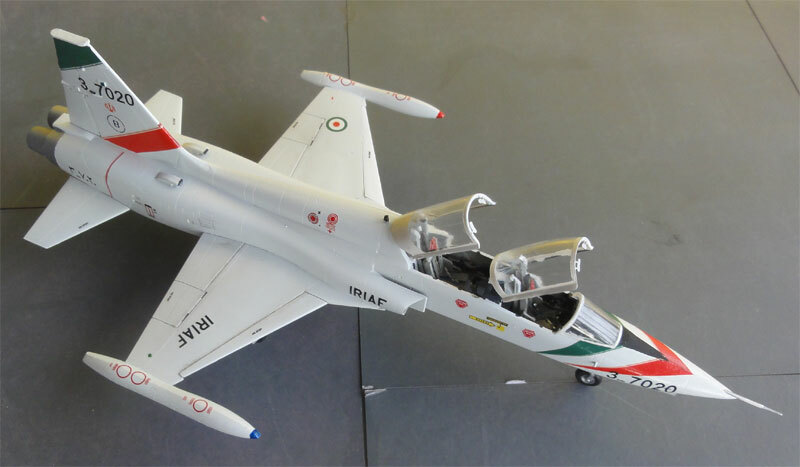 End 1990s and subsequent years saw the arrival of 13 + 5 second hand refurbished Canadair CF-116 aircraft (a F-5 version). The single seat CF-116A /CF-5A and trainer CF-116B / CF-5D became the main aircraft of the Air Wing. Transport aircraft are types like CASA C-212, CN-235, C-103 and also some Britten Norman Defenders. Some helicopters are also operated like the Bell 412. Training is done with some Pilatus PC-7 aircraft. Air bases are the main base Thebephatshwa/Molepolole and others are the capital Gaborone and Francistown. 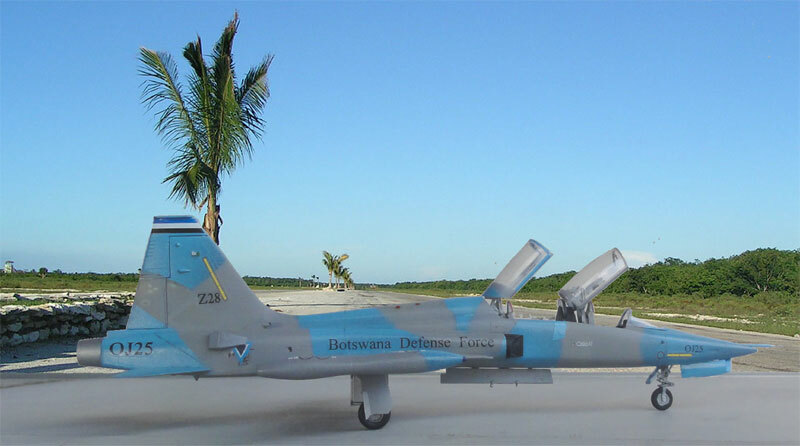 CF-5D operated by Z28 squadron the Botswana Defense Air Wing at Gaborone (approx. October 2002). 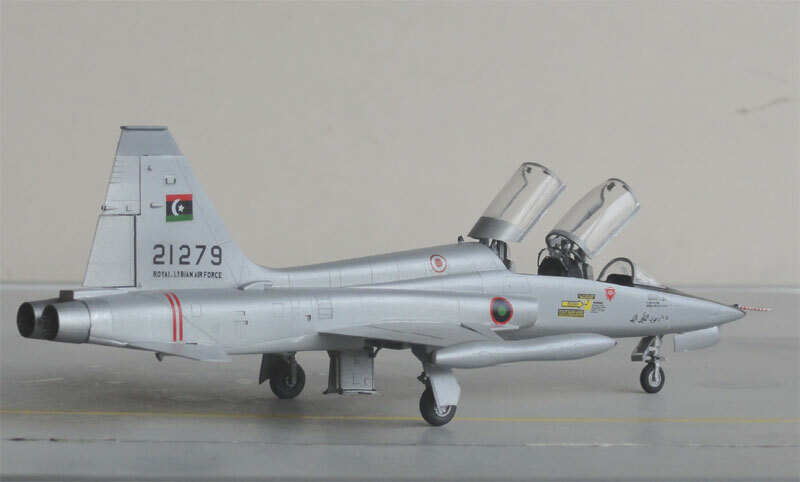 The next F-5B ESCI model was finished in a scheme of a Libya Air Force operated F-5B trainer around 1977. Model assembly was as described above. The F-5 usually had a dull natural metal colour caused by the dry Libyan desert with burning sunshine. This was achieved by airbrushing an overall coat of Revell Aluminium #99 with some White #05 mixed in. The nose anti-glare panel as well as the inboard areas of wing tip tanks were, after masking, airbrushed matt black. 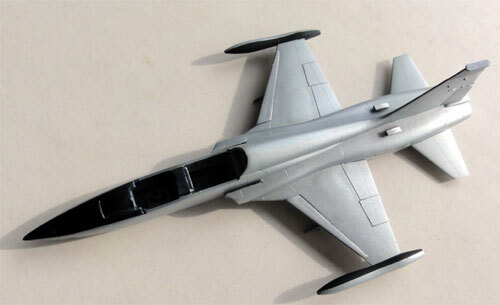 The vertical tail tip is light grey and the fuselage rear and exhausts got a burned metal coat applied with a brush. Carpena decal set 72.74 " F-5 International" was used and it has some basic markings for it. The decals are very brittle so take care when applying these. 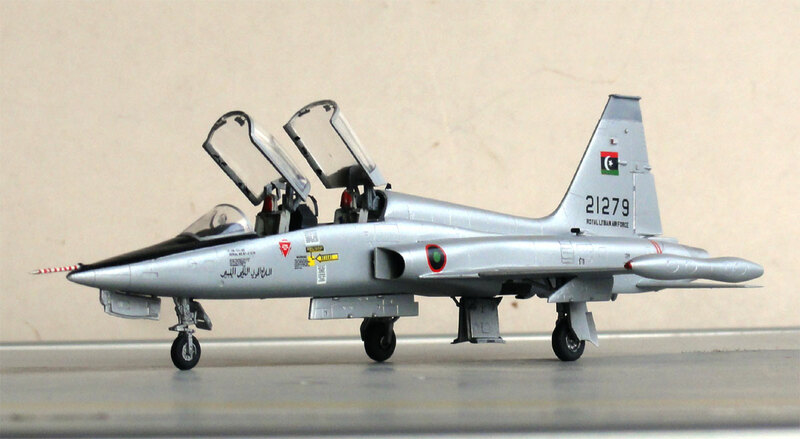 I did not add a lot of stencilling, these were hardly seen on photos of real Libyan F-5's. In addition of the wing tip tanks, 2 pylons were positioned under the wing. I knew from previous models made that the pylons #36C and 96C of this kit are not in the correct position; fill the slots and move them 2 mm more outboard when installing pylons. On photos most aircraft were seen without "stores" so the pylons were kept clean. I added a few weapon pylon braces from thin metal wire. 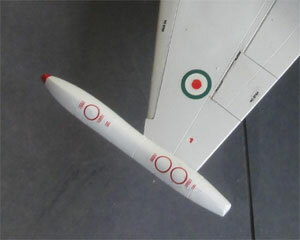 The nose pitot is a bit of a challenge showing white-red striping. This was done with a very fine paint brush. Make 3 of these and pick the best one you painted! Final completion with landing gears, end coats and so on was similar as for the models described earlier. 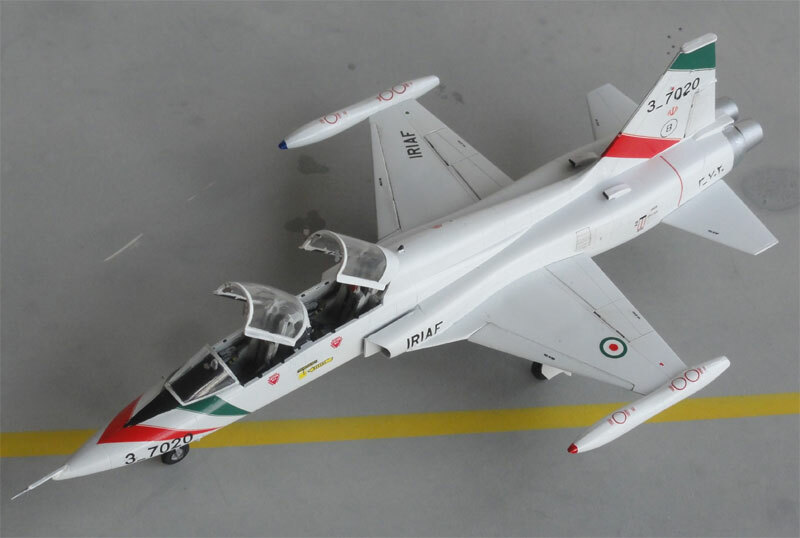 A nice model is now in the World Modern Air Forces collection. 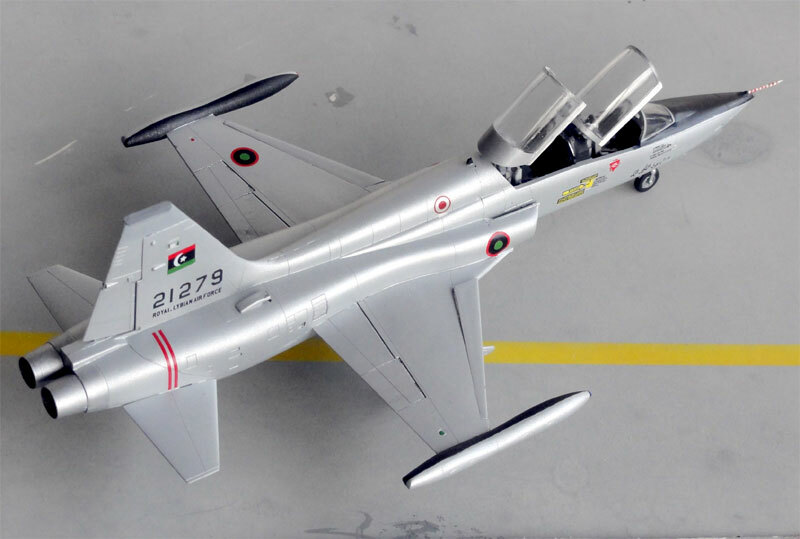 The Royal Libyan Air Force ("Al Quwwat Alijawwiya Al Libiyya") was established in 1962 with a few aircraft like the T-33 and C-47 transports. The first of probably 8 F-5A fighters and 2 F-5B trainers arrived in 1967 and at the time there was a U.S.A base at Wheelus (near Tripoli, later Okba Ben Nafi base). The military coup of 1969 led to large changes and Colonel Gadaffi who became in fact the single ruler over Libya now oriented towards the Soviet Block. Aircraft acquired were types like the MiG-17, MiG-19, MiG-23, MiG-21 and even MiG-25. Also Tu-22 medium range bombers were used. Libya was an important oil supplier and relations with France led to the delivery of several Mirages like the Mirage 5 and later Mirage F-1. Hundreds of combat aircraft were operated. Relations with other countries were difficult as Gadaffi supported various terrorist groups and an embargo was enforced by several countries. 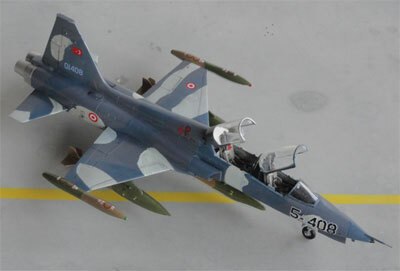 It is thought that the F-5 were not used after the mid 1970s and 7 aircraft were transferred to Turkey. During the following years there were several African conflicts such as with Chad and Gadaffi involvement. 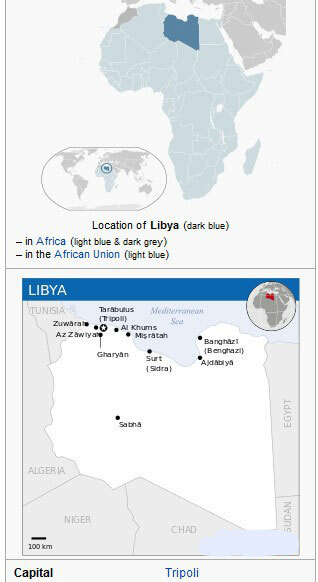 After the collapse of the Eastern Soviet block in 1990, political support to Libya was eroding. Some aircraft and parts were obtained elsewhere. In 2001 in many North African Arab countries were people rebelled against the local rulers. In Libya a civil war emerged as well and in October 2011 the ruler Gadaffi was killed. Now there are several fighting groups claiming "government" and large problems exist in this unstable region with emigration, terrorism and oil delivery. In recent years there was a relatively stable situation with Western supported national Government in Tripoli and in the East a group operating from Benghazi and Tobrouk. Beginning 2019 again unrest is part of daily life because of militia and a weak official Government. 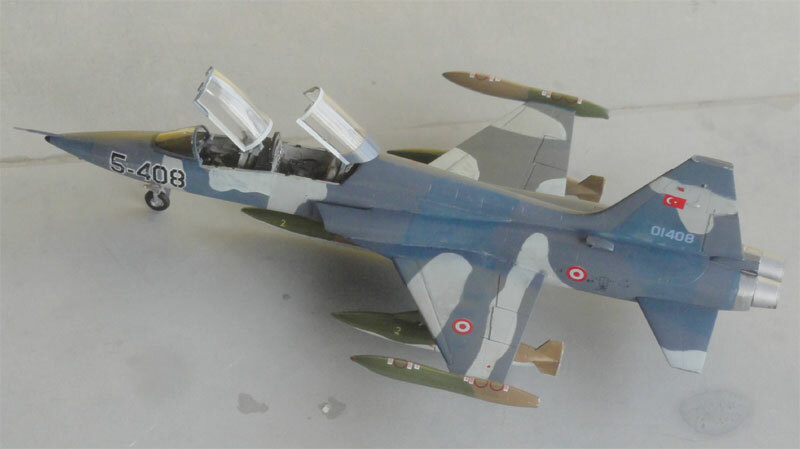 Another F-5B kit was made, now in the scheme of a Turkish air force aircraft. Turkey acquired several ex-US agressor aircraft. I saw a particular F-5B aircraft coded "5-408 / 01408 " that showed on the pylons and tip tanks some stores that were used from other camouflaged "Vietnam" style aircraft. Thus the tanks got "Vietnam" colours of Tan and Dark Green. Carpena decal set 72.74 " F-5 International" was again used and it has some basic markings for it. These decals are very brittle so take care when applying these. I did not add a lot of stencilling, even the red warning markings near the cockpit are not seen on photos. Kit assembly was similar as described above. Each colour needed masking as the demarcations look rather "sharp". Masking was done with low tack tape and Revell masking film. 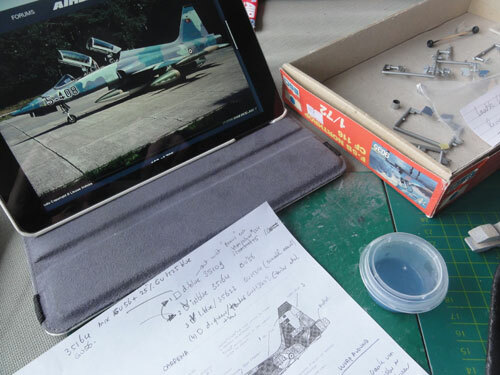 For the underwing tanks, the 2 pylons #36C and 96C of this kit are not in the correct position; fill the slots and move them 2 mm more outboard when installing pylons and stores. The Turk Hava Kuvvetleri (Turkish Air Force) was established very early in 1911 in the Ottoman Empire. At the beginning of the Second World War hundreds of aircraft were operated and Turkey kept a neutral position but obtained a wide variety of Allied British, French and American aircraft. 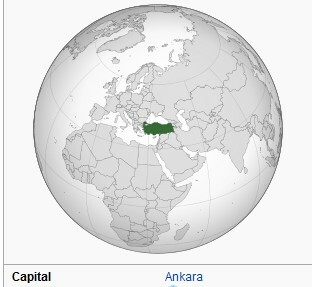 After the Second World War, NATO was established and Turkey became a member. From 1965 the Air Force obtained a considerable fleet of Northrop F-5's: some 75 F-5A, 20 RF-5A and 13 F-5B supported through the USA in the NATO MAP. They mostly replaced older F-100 Super Sabres. In the early seventies, some additional second hand aircraft were obtained from Libya. 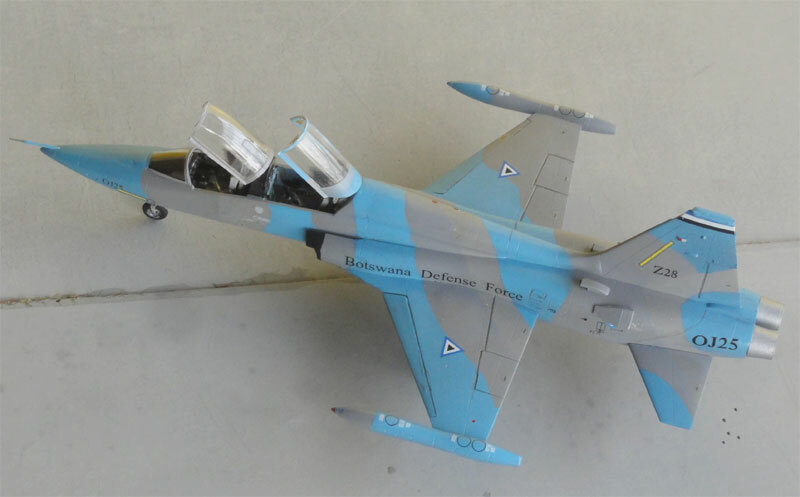 Later within NATO, from 1983 other second hand F-5 were received (e.g 60 from The Netherlands, 32 from Norway). Ex Dutch air force aircraft were used e.g at 133 Filo at Konya. The aerobatic team "Turkish Stars" also flew the F-5A. Several upgrades have been done on the fleet during the years. Other large numbers of aircraft operated are F-4 Phantoms and more recent F-16's. F-5B of Turk Hava Kuvvetleri (Turkish Air Force) , operated from Merzifon base, around 1987 . Here seen at Incirlik base also used by the USAF in Turkeye.